DigitalGlobe (NYSE: DGI) is a leading global provider of high-resolution world-imagery products and services for defense and intelligence, civil government, and commercial customers such as Google Maps. As the company continued to grow, it became increasingly important to gain more visibility and control over its total marketing operations. 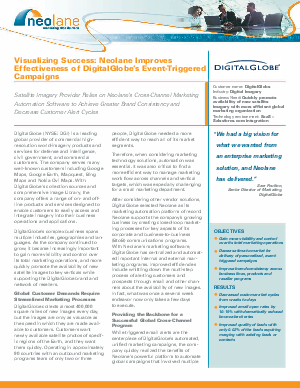 Learn how DigitalGlobe decreased time-to-market for delivery of personalized, event-triggered campaigns and improved email open rates by 10-15% while reducing bounce-back rates.